North Fork River – Devil’s Backbone Wilderness. Copyright © 2019 Gary Allman, all rights reserved. After my earlier ill-fated trip to Devil’s Backbone Wilderness I was eager to go back and complete the hike. I also wanted to get out and try to meet my goal of two nights and 20 miles backpacking per month. To do this my “Four days, three nights, and two wildernesses” trip was conceived. The Devil’s Backbone Wilderness is a bit small to hike more than a couple of days without going back over trails you’ve already visited. Studying the maps, there is an option taking in a eight mile loop of the Ozark and Ridge Runner trails, but I didn’t have time to research the route for available water sources. That hike would also end with a steep 300′ climb, so I parked the idea for the moment. Instead I went with my original plan of a three day, two night Devil’s Backbone hike. I added in a few more miles and an extra night with a quick one night stopover on the Pees Hollow Trail at Hercules Glades Wilderness on my way home. Diverting to Hercules Glades would add 50 miles to the 200 mile round trip to Devil’s Den Wilderness, so it wasn’t a big deal. My new 10°F top quilt had arrived, so I was hoping it might get cold enough to give it a test, but the forecast was only for lows of 28°F or so. Cold enough to justify using the quilt, but not cold enough for a real test. Compass Bearing Check – Where I thought I was marked on the map, and where the GPS thought I was. After a lot of research online I’d also found a very inexpensive — just $20 — replacement for my broken Garmin GPS, in the form of some GPS software for my phone. The reviews and my initial tests were good, but I was dubious about the accuracy of my phone’s GPS. I wasn’t planning to use the GPS for navigating but I did want to record my track. That and spot checks along the way would be a good test of the phone/GPS setup, if it worked in the narrow tree-lined hollows of the Devil’s Backbone Wilderness, it’ll probably be okay anywhere I’m likely to be hiking. The GPS software works with the phone in ‘Airplane mode’ which is great because it significantly saves on battery drain. Using the accompanying website you can customize, download, and print USGS Maps. That’s an excellent bonus, as I find the USGS site a pain to navigate, and there will be no more need for me to join USGS map sections together in Photoshop for printing. Day One – Saturday February 23, 2019. We’ve been having a lot of rain, and it rained during most of the two-hour drive to the Collins Ridge Trailhead. The forecast had predicted that the rain would clear between two and three pm, then the remainder of the afternoon would be clear, but it would be very windy with gusts up to 40 mph from the west continuing through the evening and night. The wind was expected to drop and switch to the north (cold wind) by morning. From the map my planned camping site would offer plenty of shelter from the westerly wind, so everything was looking good. There were no vehicles at the trailhead. I checked the sign-in sheets and the only ‘official’ visitors since I’d last been there — that is those who had bothered to register their presence — were the people I’d met on my previous trip. Only this time according to their entry they were on horseback. The west side of the Devil’s Backbone – This side is not as steep as the east side. Copyright © 2019 Gary Allman, all rights reserved. I got to the Devil’s Backbone by two pm and the clouds had cleared and the sun was out. It didn’t take long to drop down the ridge and get to the point where I’d followed the wrong trail on my last visit. I took pictures of the spot, and went off up the correct — Mary Hollow — trail, being careful to check the map and mark off my progress as I went. My Nemesis – Mary Hollow to the left, and the unnamed hollow I followed on my last visit to the right. Copyright © 2019 Gary Allman, all rights reserved. After all the recent rain I was expecting to find water in Mary Hollow. There was none. As this has been quite a wet year I think we can safely say that this hollow stays dry in most circumstances. Fortunately it was not a problem as I’d carried in enough water for the first night and the next day. 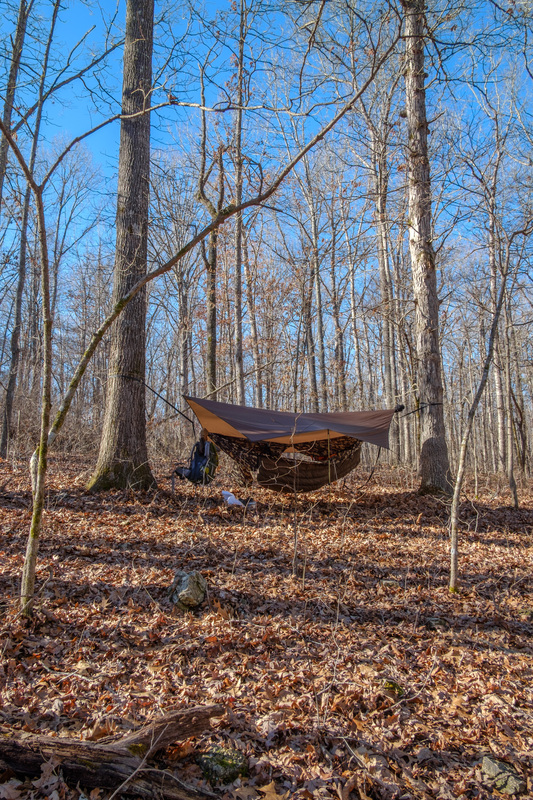 When I arrived at my planned camping spot I realized that the ridge wasn’t high enough to block the wind, and there was a distinct lack of vegetation to provide screening — Anywhere I hung the hammock would be quite visible from the trail. Not that there was anyone on the trail, but I like to be out of the way. A quick look at the map showed a nearby hollow running northeast/southwest that had steep sides and it was well off of the trail. Upper end of Mary Hollow – Nice straight trail for a while there, though I was going off-trail to the right to camp for the night. Copyright © 2019 Gary Allman, all rights reserved. Upper end of Mary Hollow – Nice straight trail for a while there, though I was going off-trail to the right to camp for the night. The hollow was easy to bushwhack up, and pretty soon I was far enough away from the main trail to satisfy my desire to be out of sight. The wind was gusting and making quite a lot of noise, so I carefully choose two strong looking trees, surrounded by lots of equally strong looking trees in the lee of the western side of the hollow. Putting up the hammock and tarp with the wind gusting was ‘interesting’ and I made doubly sure all the stakes were firmly in place as I didn’t want the stakes coming out and being catapulted who knows where. Not to mention the problem of dealing with a flapping tarp in the middle of the night. Not a soul to be seen – I was several hundred yards from the Mary Hollow Trail (deliberately this time). Copyright © 2019 Gary Allman, all rights reserved. With everything all set up I sat watching the world go by, and I was rewarded by seeing the silhouette of a deer walking along the top of the hollow opposite my camp. Day Two – Sunday February 24, 2019. Camped off trail – I found a spot well sheltered from the high winds overnight (40mph gusts). Copyright © 2019 Gary Allman, all rights reserved. It was a warm, but noisy and windy night. At least twice the wind blew hard enough to push the tarp into the hammock and set me rocking. No trees came down near me and I only heard one big limb drop nearby, so all was well. Sitting drinking my hot chocolate in the morning sunshine I saw a very healthy looking coyote padding down a ravine across from my hammock. it proceeded to head north along the opposite side of the hollow. As the wind was now (as promised) blowing from the north, it didn’t catch my scent, and had no idea I was there watching. Camped well off the Mary Hollow Trail – The skyline marks the edge of the wilderness at this point. Copyright © 2019 Gary Allman, all rights reserved. I had ended up camped about 400 yards from the main trail, and bushwhacking back didn’t take long. Back at the trail I turned right (northeast) up Mary Hollow. The trail was easy to follow except I overshot the point where the trail turns North (left) up the ridge to meet the McGarr Ridge trail. I realized my error within a few yards and backtracked until I found the turn. The leaves were deep and covering the trail (well that’s my excuse), and obviously a lot of people miss the junction with a well-worn trail going straight past the turn, making it even harder to spot. By one pm I’d joined the McGarr Ridge trail, and as I expected I had reasonable cell phone service, and made my daily check-in call to Ginger. The McGarr Ridge Trail was easy going, apart from the northerly wind. Despite the sunshine it was quite chilly. McGarr Ridge Trail – More Ozarks leaves and bare trees. Copyright © 2019 Gary Allman, all rights reserved. Heading west there are four places were other trails join the main trail. The first is where the Mary Hollow Trail joins (this was where I joined it). The second is not marked on the maps, but was a junction I knew to expect where an unofficial trail to McGarr Spring joins from the south east — bear right at the junction to keep on the McGarr Ridge Trail — the third is where the Blue Spring Trail joins from the north. This trail is marked by graphic signs warning horse riders not to use the trail. The fourth and final point is where a spur trail linking the McGarr Ridge Trail to the Mary Hollow and Collins Ridge Trails joins from the south, crossing Crooked Branch near a spot called Cow Ford (according the 1930 map of the area). The wilderness brochure claims that the trails are maintained. They are not, and have not been for many years (I’ve read reviews of the trail going back to my own in 2011 complaining about the poor state of the trails). This means that the trails meander a lot around fallen trees and the McGarr Ridge Trail has left the line of the old forest road in lots of places. The route the forest road originally followed can still be seen if you look carefully. The trail ends at the North Fork river, and the area here has been severely affected by heavy flooding in the past few years. There are lots of trees down near the river, and access to the river is nowhere near as easy as it was back in 2011. The first sign of flooding I noticed was some debris around six foot up a tree. Nothing unusual in that except I was still 200 yards or so from the river, and around 60′ above the river level (No exaggeration). Signs of Flooding – 6′ up a tree, only I’m at least 60′ above the current river level, and a couple of hundred yards away… Copyright © 2019 Gary Allman, all rights reserved. Nearer the river I saw debris 20-30′ up in the trees. The only easy route down to the river I found was down a sandy bank onto a sand spit on the north side of Crooked Branch. North Fork River. Copyright © 2019 Gary Allman, all rights reserved. There is a campsite a short way north of the trail here, but I decided to take a look further north, and by following an old trail with some bushwhacking thrown in, I found a couple of good spots, one with a fire ring. However, access to the river for water was nigh-near impossible with low bluffs all the way, so in the end I went back to the spot nearer the trail with close-by access to water. Getting to the water wasn’t easy, nor was filling the bag. I resorted to the trick I tried on my last hike — Using a Ziploc bag to fill the dirty water bag. It worked but isn’t ideal, as the water dribbled everywhere and then the sand stuck wherever things were wet. One problem with this area is that the ground is sandy, and the sand gets into everything. I have very thin stakes for my tarp — great for the rocky ground in the Ozarks, but not much help in sand, so I made longer thicker stakes out of branches, and drove them into the ground. There was plenty of loose wood around so I collected a load so I could have a fire to warm myself up as the evening came on. Camped near the North Fork River. Copyright © 2019 Gary Allman, all rights reserved. Day Three Morning – Monday February 25, 2019. Frost on my tarp. Copyright © 2019 Gary Allman, all rights reserved. The weather forecast lied. It dropped to 21°F (-6°C) overnight. The new top quilt worked a treat and I was nice and warm. It is made of some really silky feeling material which appears to be fairly moisture resistant. I woke up to a frost covered tarp, and a very chilly morning. Fortunately I’d brought my water filter and camera into the hammock with me (neither like sub-freezing temps). One of my water bottles was slushy, the other had frozen solid. I wanted to be away as quickly as possible but I stayed in the hammock until the sun was starting to warm things up a bit. Even then it was still well below freezing when I started heating some water for a drink and breakfast. For the first time it took me a couple of attempts to get the stove to light. However, that could have been easily rectified by putting the stove in my pocket for a few minutes before trying to light it. Cold Start – It dropped to 21°F (-6°C) overnight, and it was still well below freezing when I hauled myself out of bed. Copyright © 2019 Gary Allman, all rights reserved. End or Part One – Three nights, two wildernesses. Here I am at the end of my Devil’s Backbone Wilderness trip. Copyright © 2019 Gary Allman, all rights reserved. Despite my wish to get away early, I wasn’t underway until ten-thirty. The first bit of the trail was easy, and the spur trail over to the Collins Ridge trail was very easy to follow until I got to Crooked Branch. The creek was chock-a-block with downed trees and it was awkward finding a route through. Once I did, the Collins Ridge Trail, which starts on an old forest road, was easy to follow. I saw no sign of the Mary Hollow Trail, which was supposed to join the Collins Ridge trail at this point. The Collins Ridge trail Starts with a long slow climb of 300′ in slightly less than a mile. I surprised myself by making it to the top in half an hour. Thereafter the trail is fairly level running through woodland. One long section runs straight west to east, and at a fallen tree it looks like a lot of people go a long way off trail to the south. I discovered that the trail continues on the other side of the fallen tree, and there’s no need to go south at all. Interestingly the trail marked on my map showed the detour to the south, so whoever made that track was lured off-trail too. By eleven forty-five I was at the Devil’s Backbone Trail junction. Near there I met a bunch of guys on horseback — the only people I saw on the entire trip — One asked if there was anything to see. I replied, “Just trees and leaves.” By noon I was back at the parking lot and ready to set off to Hercules Glades for my next hike. Day Three Afternoon – Monday February 25, 2019. The 100+ mile drive over to Hercules Glades along Hwy 160 took a couple of hours. I’d left some water in the van to use at the start of the second leg, so I emptied out my filtered water and filled my canteen with the ‘fresh’ water. I should have tried it first. It tasted horrid. I was only planning a short hike, so I decided to either filter some on the way, or wait until I got to the creek at my destination. Start of Part Two – Three nights, two wildernesses. Here I am at the registration point at Hercules Glades. Copyright © 2019 Gary Allman, all rights reserved. Clockwise around Pees Hollow is a hike I’ve now done many, many times, and I planned to spend the night near ‘Cab Creek’. I stopped part way to see how good my navigation was by taking a bearing on a prominent un-named knob. I also stored a waypoint on the GPS. My dead reckoning, bearing taking, and GPS all put me at around the same place, which was a relief after getting ‘misplaced’ on my last trip. It was a quick hour-and-a-half hike, I only stopped to take the bearing and later for some pictures of a set of small, but very noisy falls. Small falls on ‘Cab Creek’. Copyright © 2019 Gary Allman, all rights reserved. Setting up camp was a bit more complex than normal as one of the trees I chose was decidedly ‘springy’, causing the tarp to droop when I got in the hammock. I had to fix up some extra lines to keep the tarp up off of the hammock. The ground was wet, and it was late by the time I’d set everything up, so I didn’t bother to look for firewood and just turned in to read after dinner. One day I’ll download a book to read on my phone instead of lugging around a huge 500+ page paperback. Day Four – Tuesday February 26, 2019. Another Frosty Night – It dropped to 23°F (-5°C). Camped near ‘Cab Creek’. Copyright © 2019 Gary Allman, all rights reserved. Again it was a lot colder than forecast overnight. 23°F this time, and once again the tarp was covered in frost. However, this time I managed to get up and away a bit faster, being on the trail by ten am. I diverted off trail at Brushy Creek to take pictures of the creek flowing. The noise was a lot more impressive than the creek looked in the pictures. Lots of Frost – It dropped to 23°F (-5°C) overnight. Copyright © 2019 Gary Allman, all rights reserved. At the Cab – A quick selfie with the cab as I start the final lap of my trip. Copyright © 2019 Gary Allman, all rights reserved. Colorful Trail – The trail is quite pretty in places. Copyright © 2019 Gary Allman, all rights reserved. Confluence of Brushy Creek and ‘Cab Creek’. Copyright © 2019 Gary Allman, all rights reserved. Anyone at home? Either someone has taken up residence or a predator has been looking for a meal. Copyright © 2019 Gary Allman, all rights reserved. Hiking up out of the hollow, I remembered to check for a badly placed trail marker. I’d also remembered to bring a sharpie with me so I added an arrow to the marker to show exactly which way the trail goes at that point. A few years ago Ginger and Katie had gotten off-trail here and spent a good few hours wandering around before back-tracking out. Bad Trail Marker – Fixed. I remembered to bring along a sharpie this time. Copyright © 2019 Gary Allman, all rights reserved. The trail was wet in places … Most places. Copyright © 2019 Gary Allman, all rights reserved. It was a hot morning, with temps in the sun in the high seventies. I stopped for a quick lunch on a glade with a view of the tower. I also took the opportunity to take another compass bearing. Again I was pleased to see that everything agreed as to where I was. The remainder of the hike was just a slow slog uphill. I arrived back at the trailhead just before one-thirty pm. View from the glades looking north west. I don’t get tired of this view. Copyright © 2019 Gary Allman, all rights reserved. The end is in sight. The tower marks the trail head and the parking lot. Copyright © 2019 Gary Allman, all rights reserved. The Tower. Copyright © 2019 Gary Allman, all rights reserved. In total I’d clocked up 17 miles and 1,545′ of Elevation. I managed to hit my monthly target with a total of 25.6 miles, and 4 nights out. Selfie by the trail – The Ribz front-pack has ample space for everything I need immediatly to hand while hiking. Copyright © 2014 Gary Allman, all rights reserved. I’m really enjoying having stuff easily to hand in my Ribz front pack. It saves me having to stop and take off the backpack. When I hike with Ginger it’s not so much of an issue, as we can always help each other out by getting stuff that is not within reach, but solo hiking, you have to take the pack off. Overnight I can fasten the pack around the hammock’s ridge line which keeps the contents close to hand but out of the way. Another bonus, but I need to find a way of stopping it from sliding along the ridge line. The Ribz pack is definitely going to become part of my regular gear, though we’ll need to see how well it holds up once the temperatures start to climb. I attached the map to my journal, and that worked well. It gave me a surface to write on, and I didn’t lose a map. The surface was big enough for me to use to plot the bearings I took. Keeping regular notes on the map worked well too, and helps with the navigation, though the pencil marks do rub off easily. I’ll use a pen in future. Map and Journal – This is working for me while I don’t need full sized maps. Copyright © 2019 Gary Allman, all rights reserved. The compass worked great and my bearing taking and map work put me where I thought I was. I’m still thinking that the compass is overkill for what I need, but I’m happy with it. Using the phone as a GPS worked very well. In fact it is much better and easier to use than the Garmin. The user interface is much easier to use, and you can easily type notes on the waypoints. The printed maps were good too. Definitely another winner and I’ll be using it in the future. Not using stuff sacks is definitely the way to go. I cannot see me reverting to using them. A thick plastic trash can liner works just as well and doesn’t over compress the down in my quilts. I’m also finding that it is helping me keep less stuff in my hammock as all my clothes live in the bag too. The new water filter works very well. So well that I’m toying with the idea of not taking my bigger water bottle out on my next trip. I can use the 32 oz ‘dirty’ water bag and filter water as I need it into my canteen. I am still have problems filling the dirty water bag, but I have an idea for fixing that. After use the filter dribbles water out of the dirty water end so I’ve been keeping it in a Ziploc bag to keep my stuff dry. I’ve also had an idea of how to fix that, which will let me dispense with the bag and keep everything dry. I need to optimize the split of stuff between my Ribz pack and backpack. I’m carrying far too many Ziploc bags, I need to get rid of as many as possible. Filling the water filter bag is too darned difficult and I can never get it full. I need to find a new way of doing it (as mentioned above I have an idea). Don’t bother trying to use a bendy tree with the hammock, it’s more hassle than it’s worth. Always assume the forecast is going to be out by 10°F in either direction. Notionally that means I shouldn’t be staying out when they predict 25°F weather. I’ll be using that as my bottom forecast limit in future, unless I want to cart around more insulation. Good report, Gary. Trees and leaves would not get me to do the hike but meeting a goal would. I’m impressed by your navigation skills.